At the present time, ordination is reserved only to men in the Roman Catholic Church. Today’s daughters are told they can be anything that is “right” for them. But, such is not the case in Church. What do we say to our daughters, when they have discerned a call to the priesthood and are prepared to follow through? What do we say to their communities and the Church at large, when they suffer from the denial of women’s God-given gifts? 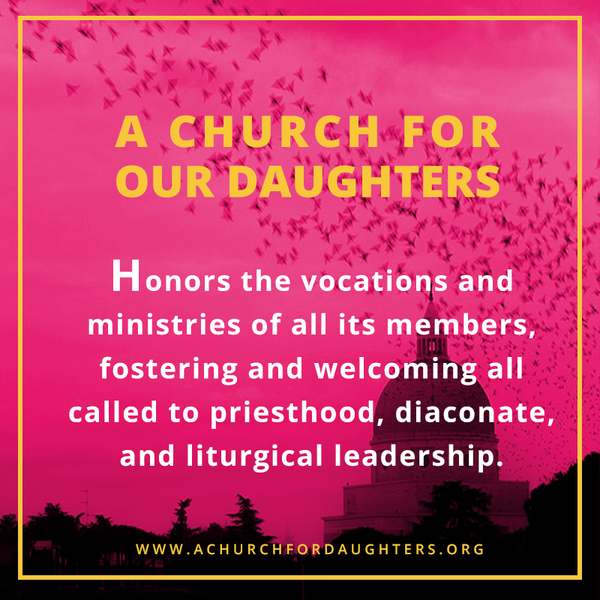 We, the Church, the People of God, must probe this issue, our history and our present needs, and then discern the full participation of called and gifted women through ordination. This divine call comes to women in the same way it comes to men: through a mentor, through deep-seated knowledge that this is the only way to live, through the surprises of God. And yet, canon 1024 of the 1983 Code of Canon Law presumes to proclaim that only men can be ordained. What does Scripture say? In 1976, Pope Paul VI asked the Pontifical Biblical Commission: what does Scripture say about women’s ordination? Their response - after noting all the ways in which Jesus respected women, conversed at length with them, welcomed their following him, and sent them forth with the Good News – was this: “It does not seem that the New Testament by itself alone will permit us to settle in a clear way and once and for all the problem (my emphasis) of the possible accession of women to the presbyterate.” Indeed, they made note of outstanding women leaders of house churches at the very dawn of Christianity, like Prisca (Priscilla in Acts). She and her husband Aquila led house churches in Rome, Ephesus, and Corinth, and she was also known as a powerful teacher (of Apollos) and preacher. Is it not conceivable that she would have presided at the “Breaking of the Bread”? Might not others, like Lydia in Philippi and Nympha, mentioned in Colossians 4:15, have done the same? And Tradition? This is difficult to uncover with any certainty, given that church documents and history were written by men, many of whom regarded women as inferior to themselves. Furthermore, the first documents on sacramental worship do not appear until early in the 3rd century. Yet there is evidence of ordination of women deacons. Also, we find stories of strong women, like St. Bridget of Ireland, about whom it is said that she was ordained a bishop. What does contemporary experience say, from the time of the Second Vatican Council? Pope John XXIII correctly noted, in his April 11, 1963 Pacem in Terris, that women were coming into their own. Indeed, women were beginning to study theology and Scripture, and some would become outstanding scholars. The question of women’s ordination was already fermenting. In 1974, the Episcopal Church “irregularly” (without the approval of the Church’s General Convention) ordained 11 women in Philadelphia. By 1976 that approval was given, for them and others, from that time on. In 1986 a group of Roman Catholic women, having participated in a Women’s Ordination Conference the year before, entitled “Ordination Reconsidered,” formed a covenant community of women seeking ordination. Known as RAPPORT (Renewing and Priestly People: Ordination Reconsidered Today), they began meeting twice a year, one of those times when the U.S. bishops would gather in Washington, D.C. in November. They advocated in a whole host of ways: meeting with “friendly” bishops, working on the ill-fated letter of the U.S. bishops on women, helping sponsor the U.S. visit of Ludmila Javarova, ordained into the underground priesthood in Czechoslovakia (see her story in Out of the Depths by Sr. Miriam Therese Winter), and finally becoming active in COR. In October 2005, they participated with Upstate NY Call to Action in placing an ad in NCR, signed by hundreds of people, that discussion of this issue must be opened up, for the good of the Church. And yet, official Roman Catholic teaching has not budged. On October 15, 1976, the feast of St. Teresa of Avila, Pope Paul VI declared (in Inter Insigniores) that women could not be ordained. Why? Because only men could be in persona Christi, because the priesthood is not a right but a choice of God for the good of the Church, because this has nothing to do with “human progress of society or of the individual.” The first argument has been found wanting. For the Church has long recognized the difference between the male Jesus of Nazareth and the Christ of faith, available to all (through Baptism, all become in persona Christi). As for the remaining arguments, they apply to men as much as to women. But on May 22, 1994, (in Ordinatio Sacerdotalis) Pope John Paul II reaffirmed this denial of orders to women, even shutting down all conversation on the issue (“this judgment is to be definitively held by all the church’s faithful”). Nevertheless, conversation continues, as well it must … because of our daughters … because of the needs and the health of our beloved Church … because Eucharist is central to our lives of faith … because all Catholics must receive the riches of our faith tradition … because it is the Holy Spirit who has the final word.